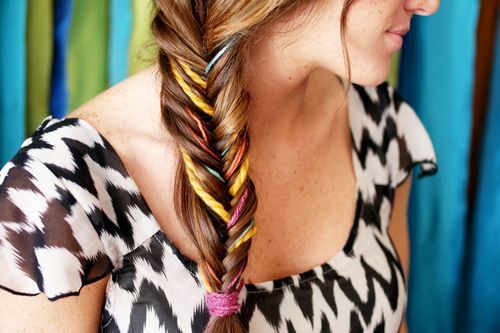 Isle Style : Fishtail Obsessed! Yesterday on my tumblr I posted a gorgeous turquoise fused fishtail braid that just blew me away, so as you can see I am still on that hair kick! 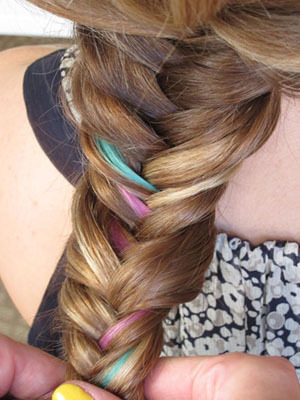 The cool thing is you can add colored pieces rather that dying your hair and make this fun look too permament. For a tutorial click here. So with you! It's my new got to hair style! If only my hair was long NOW! I do love Bazaar. It has items that are wayy to expensive for me but I use them as inspiration to find cheaper versions. I remember an older cousin doing this to my hair during a road trip to DC. Love adding color to it, I would have never thought of it. so pretty!! I love the colors mixed in!